A special cushioning technology developed by a Washington based company is effectively being used in the structure of anti-fatigue mats and platforms. The resulting floor surface is cushioned to attenuate impact shock and reduce fatigue in standing workers. The functional unit used in these mats and platforms is a patented structure called a SmartCell. The top of the SmartCell forms a rigid surface area of the mat where deformation upon contact is minimal. As weight is applied to the surface impact energy is absorbed by a controlled buckling of the rubber cylinder at the base of the structure. The resulting effect is a mat that is firm to the touch but gets softer as it is walked on without bottoming out. 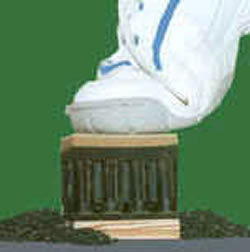 With most foam mats impact energy is absorbed as the foam cells are crushed from top to bottom. The mat gets harder as it bottoms out. As the surface deforms under the load it become unstable forcing the body to expel more energy in order to make excessive adjustments to maintain a balanced stance. SmartCells have an engineered structure designed to create maximum fatigue reduction. 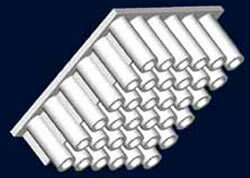 There is a regular alternating pattern of firmer and softer zones, each only half and inch across. The effect of such a structure is supported by research demonstrating that small variations in the compliance of a floor surface encourages small movements of the ankle, stimulating the return of venous blood from the calf muscles and reducing fatigue and discomfort. SmartCells was developed by SATECH, a company located in Fife, Washington. It incorporates the SmartCells into individual mats available in 2x3 of 3x5 sizes that have broad applications in sport surfacing, medical and laboratory settings, manufacturing and assembly operations, and in retail, customer service and home workstations. The mats are OSHA compliant, 0.5 inches thick with beveled edges. SmartCell platforms are custom installed to fit any area and come in a 1 or 2 inch thickness to reduce worker height. The edges of the platform are made of OSHA compliant yellow diamond plate aluminum ramps. Both the mats and platforms reduce foot, leg, back, hip and knee pain associated with standing work and improve worker productivity and morale.